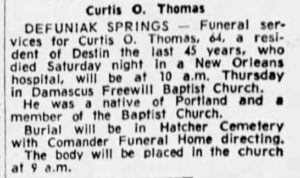 DEFUNIAK SPRINGS — Funeral services for Curtis O. Thomas, 64, a resident of Destin the last 45 years, who died Saturday night In a New Orleans hospital, will be at 10 a.m. Thursday In Damascus Freewill Baptist Church. 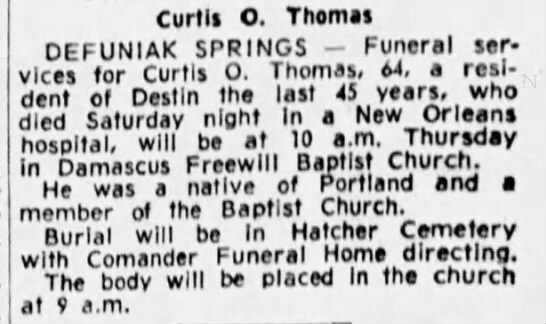 He was a native of Portland and a member of the Baptist Church. Burial will be In Hatcher Cemetery with Comander Funeral Home directing. The body will be placed in the church at 9 a.m.